Look at your target; both eyes open. Raise your arms; bow slightly canted. Three fingers on the string; index finger above, middle and ring finger below. Pull the string using your back muscles by bring the shoulder blades together; bring the middle finger to the corner of the mouth. Again, the elbow dropped. Again and again and again and again. I took video (and posted it on my YouTube channel), so I could see what I was doing. I practiced in the mirror at home without a bow. I practiced on the range. I practiced concentrating on the elbow, then something else would go wrong. My arrows generally made it to the target, some hit the bull’s eye. 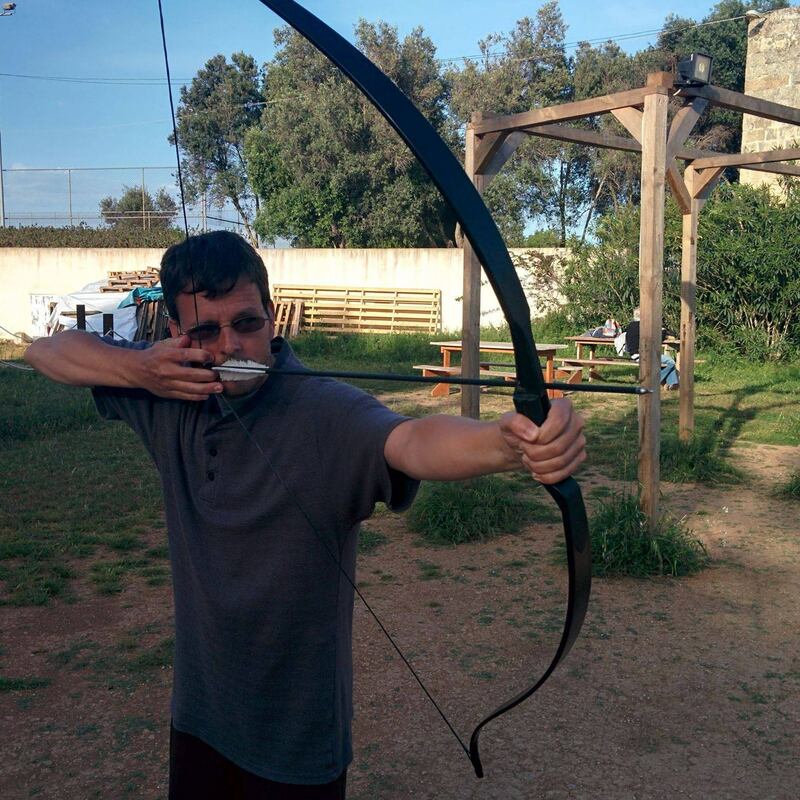 But it took me a long time to get my form correct, even with Armin Hirmer and Andy Hillsden at Malta Archery coaching me and reminding me about smaller form issues. It took a lot of practice and patience, and at some point, I learned from my failure and got better at archery. Creativity takes practice, patience and the willingness to continue even after mistakes and failures. As an instructor, I found that most people were afraid to trust that their minds and eyes will work together to get the arrow on the target. There’s no aiming. You simply point and trust yourself that your body knows where to send the arrow. Most people wanted to look at the arrow, but you don’t look at a ball when you throw it. You look at the target. With instinctual archery, you have trust yourself. You have to trust that your body will do what you want it to do. In creativity, you have to trust your judgement. You have to understand that you know what you want to accomplish and experimenting will get you there as long as you have knowledge in the field or domain. You are creative. Sometimes, beginners would come in and just want to shoot the bow the way they wanted to shoot the bow. They saw it on TV or had made their own bow when they were much younger. Some thought the bows were toys, so they didn’t need instruction. Whatever the reason, they didn’t want to learn how to shoot the bow with any form. People who shot guns also would not want to learn how to shoot a bow. They thought their gun shooting skills would transfer to the bow. Either they shot too high or didn’t get the power out of the bow they should have. Olympic style archers don’t want to learn instinctive archery. They would come in and shoot in the Olympic style even though the equipment wasn’t made for it. Bows would crash to the floor. Even good archers would miss one out of three arrows. Some were stubborn; some didn’t want to ruin their form. Instinctive archers using the Mediterranean draw wouldn’t want to learn thumb draw, even when the bow was clearly made for thumb draw. Getting a full pull out of one of these bows required more pull. Instead, the archer was content with getting half as much power and beauty as he or she could have out of the bow. Thumb draw hurts when your thumb isn’t used to it. The people who enjoyed archery the most were the ones who went in for learning everything and it made them better archers because they could adapt their style to their equipment. That’s true of creativity, too. You need to use the tools you have, and many of your tools will come from what you have learned before. Keep learning and get the most out of your creativity.